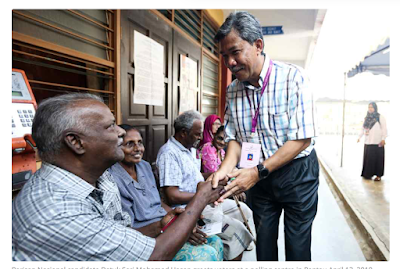 Puchong, 150419: Some would even say that in this man affectionately called Tok Mat by political friends and foes alike we're looking at a beacon of the nation's very future. Not just BN's. You may disagree, of course, and choose your half-boiled and scrambled eggs running this country today (not all in today's Cabinet are clowns but read here for one of many reasons why we're in the state we are today). The Malay Mail article quotes a political analyst saying that "In Malaysian politics and power relations among competing multi-ethnic parties and interests, being moderate is a vital principle" and "Tok Mat is a genuine moderate". That, however, did not win him the Chinese support in Rantau. (Read full article h e r e). Maybe the Chinese voters like more than beacon and eggs for breakfast ..